When I was a kid we would always hit up the weekend markets. These markets were a mixture of flea markets outside with regular food vendors inside. I come from near Amish country in Pennsylvania so on the way there it wouldn’t be strange to pass a horse and buggy going by. Once at the auction first you would browse the treasures outside ($2 rainbow ceramic pie pan!) while working up a appetite. Next stop would be the Amish stands outside where you could buy fruits and vegetables at discounted prices (hello 4 for $1 corn on the cobs). Finally you’d go inside and grab lunch or head to the butcher to buy meat for dinner that week. There was a popular place inside one of these markets that sold a chicken breast stuffed with potato stuffing. Not only was it stuffed with it but it was also laying on a bed of it. It was one of my favorite meals. We would buy a couple to eat throughout the week but as soon as we got home mom or dad would make me one right away. Last week I was craving that potato stuffing so I made a batch of it and boy (and girl) was it delicious. As soon as I mixed everything into the saucepan, the smell of nostalgia hit me. Isn’t it amazing how sensitive we are to smell and how just a little whiff of something can make us recall memories so quickly? That’s what happened with this potato stuffing. I was in my kitchen in Brooklyn, but in my mind I was a kid being served by mom and dad back in Pennsylvania. 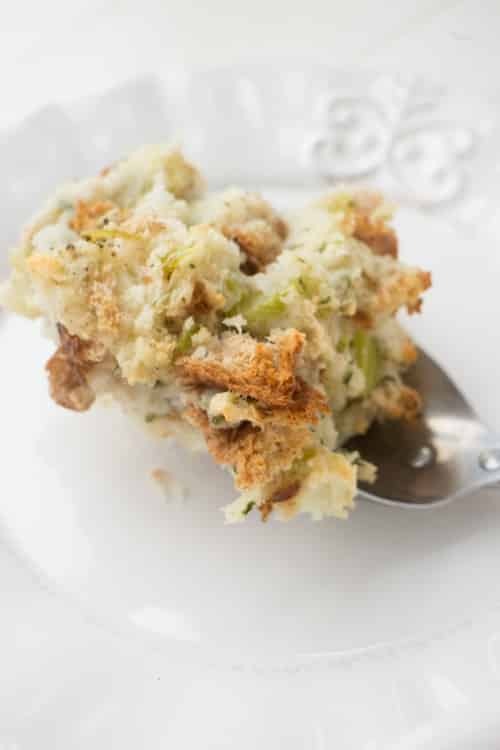 I served this Amish Potato Stuffing alongside some chicken and it was the perfect meal. 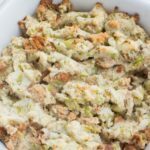 The stuffing is so easy to make that I ask next time you are craving it, skip the boxed stuff and make this. You’re going to fall in love and that’s what I want you to do! 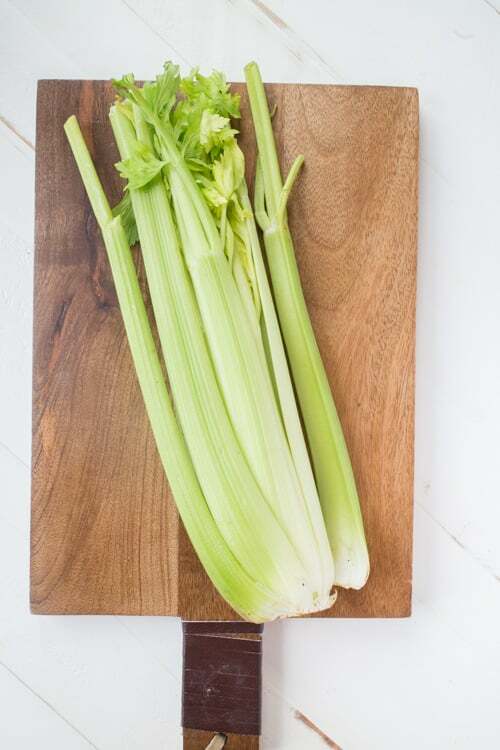 You need some nice celery stalks for this stuffing. Besides celery, you’ll want to chop up a onion and then saute it with some butter on the stove. It’s that easy. What I love is that right outside that frame of this picture this is what’s happening. Goblin is sleeping, dreaming of potato stuffing. 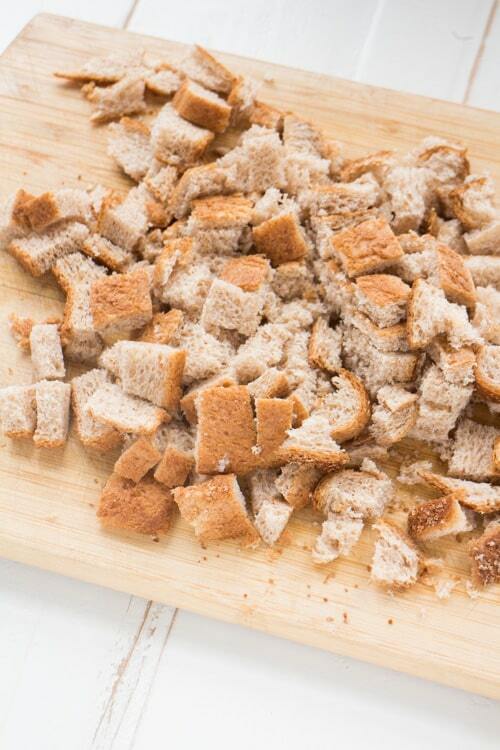 You can tear up your bread or use a knife to do it quickly. You can use white bread if you want, but I use whole wheat because that’s all we ever buy. You’ll also need 3 cups cooked mashed potatoes. 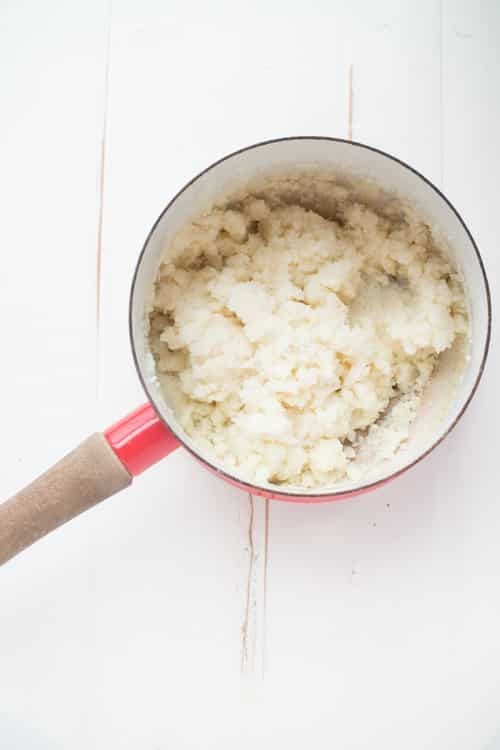 You can go the long and delicious route of peeling potatoes, boiling them and making homemade mashed potatoes. Or you can be like me and make instant mashed potatoes and be done with it in 5 minutes. Now get your oven preheated and grease up your casserole dish. Throw this dish in for 50-60 minutes. Holy moly, I’m in love. I really want to stress how important the sage is in this recipe. You don’t need much of it, but sage is what gives stuffing that special taste. Please make sure you include it for this stuffing! I hope you guys enjoy this Amish Potato Stuffing as much as me and my family does. And of course, this makes the best Thanksgiving Day Stuffing! It’s a tradition for my family to have this on the Thanksgiving table every year! 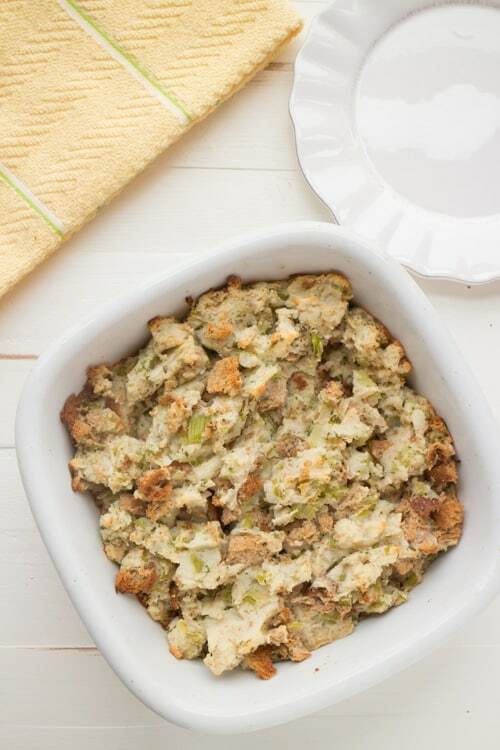 Looking for more stuffing recipe? Try my Blueberry Thanksgiving Stuffing or Cheesy Broccoli Stuffing! 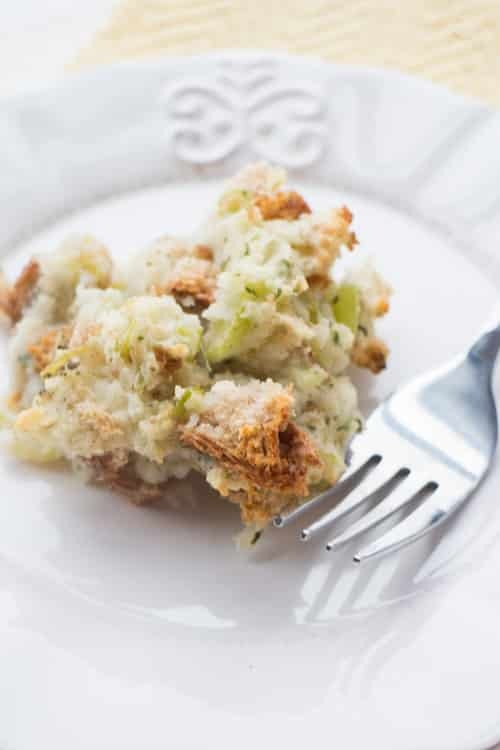 A delicious potato stuffing recipe, just like the Amish make it in Pennsylvania Dutch country. 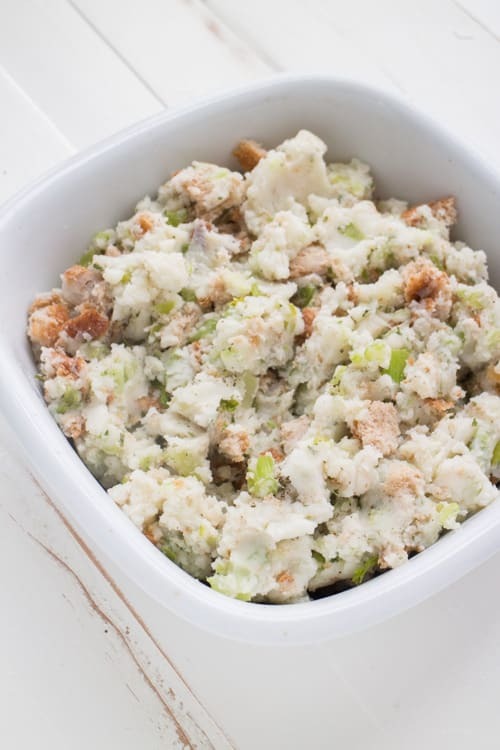 You'll love how easy and authentic this Amish Potato Stuffing is! 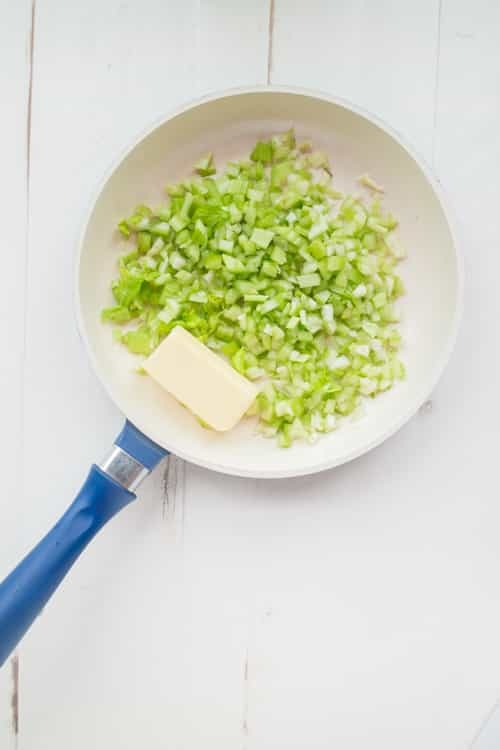 In a large pot, saute the onion and celery in butter over medium high heat for 5 minutes. Remove from heat and stir in bread, potatoes, sage, parsley and salt + pepper. Grease a medium sized casserole dish and pour stuffing mixture into it. Bake, uncovered for 50-60 minutes or until the top is slightly browned and crispy. Sage is super important in this recipe so please don't skip it! Hmmmm….could I have some for breakfast? Topped with an egg? 1. I wish my furbabies slept peacefully on the floor while I was taking photos rather than trying to EAT the food any time I looked away. 2. Mashed potatoes IN stuffing is basically the best idea ever. Why waste time piling stuffing on top of my mashed potatoes on my plate (other people do that, right?) when it can all be mixed together from the get go. sleeping on clouds…I love the sound of it. The stuffing looks really nice, Pamela. Haha, sleeping on the clouds, whatever that means, I’m game! 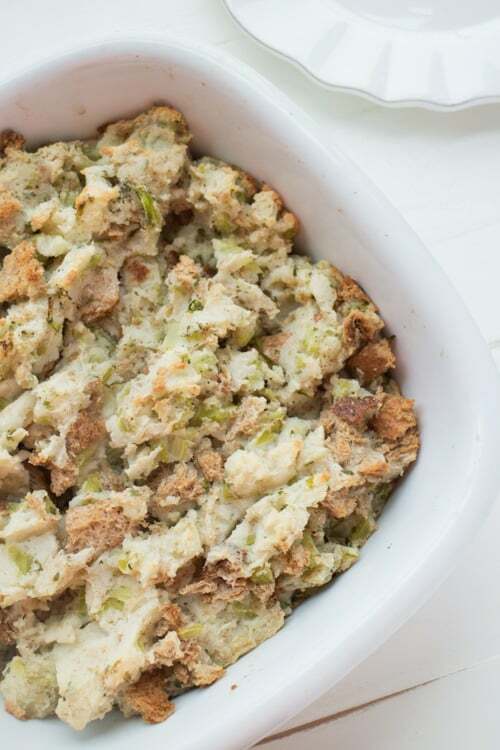 This stuffing sounds amazing! Love it, it’s carb heaven!!! and Goblin sleeping is waaaaay too cute. This looks SO good, Pamela. I’ve never thought of potato stuffing. Love the idea and will have to make this soon! Okay, this looks absolutely DELICIOUS! Thanks so much for sharing this recipe! Looks perfect for sweet potatoes! OMGosh Pamela – I swear I could eat stuffing every day I love it so much. I’ve never had stuffing with potatoes before though – and it sounds amazing! YUM! This looks lovely! Perf for a warm summer BBQ! Great recipe! Thanks for sharing!! I never think of making stuffing except at Thanksgiving! What is wrong with me? This sounds easy and so delicious, Pamela! I grew up in southeast Pennsylvania, around there they called it potato filling. As a child I never liked it. I guess next time I visit I’ll have to get my sis-in-law to make some. As an adult I like a lot more things! This recipe looks very Yum Yum! I would serve it with some good organic sausages,….mmmmmmm! Yum! This would be a perfect Thanksgiving dish. I love the photo of Goblin! 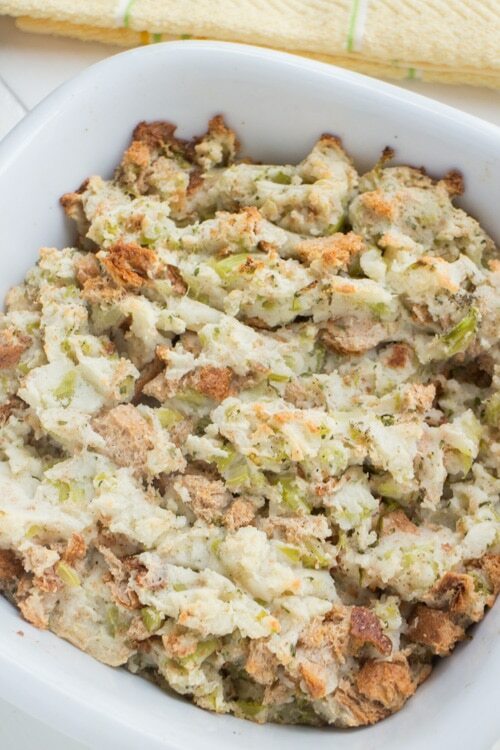 My Aunt Pat used to make this stuffing and don’t ask me why I have never made it as an adult! Super easy and delicious! Thank you for this recipe and reminding me of it! It is super easy to make and delicious as well. One note: My mother cuts the bread the night before and leaves it out (covered with a cloth) so the bread has a little more body when you mix it in with the potatoes. Also this freezes beautifully before you bake it. Just let it thaw overnight in the fridge before baking. I have been making potato stuffing for years. I also add raw eggs, and dried parsley to the mixture…so yummy. Love the thought of mixing the 2 together…one pan!! And instant potatoes are a necessity in any busy home…I have found Ore Ida the best and many variations to choose!! Thanks for all your ideas…love love love? Hey Laura, I hope you enjoy this stuffing – I’ll be making it twice this week for Thanksgiving because we love it so much! Just like my mom’s recipe (we grew up near Lancaster county,pa )except she added an egg to bind the stuffing and add flavor. She also added thyme too! I love the addition of thyme – I will try that next time! Thanks for sharing Kim! Enjoy! What about egg? That’s how we make it. Hey Jaime, no eggs are needed for this recipe. Hi stupid question but is the bread fresh or stale? Also can you stuff a turkey with this? Hey Cathy, I use fresh whole wheat bread. You can stuff a turkey with it! Enjoy! I’ve seen/heard it called both there, I prefer “stuffing” – Mom used to always call it that as a kid too. This is the same as the turkey stuffing my mom used and I use today still except we use summer savor rather than sage……….Love it………. Yum, that sounds great Patricia! Up until I was in my late teens, I never tried bread stuffing. This is the only stuffing I ever had! I love it! Hey Emily, thanks for commenting! I’m so happy you liked this stuffing so much! Me too!!!! After eating this, who would ever eat the dry stuff??? that was our family stuffing growing up I try to make it yearly.We add lots of Bell’s seasonings and I am aware that it is not sold everywhere. Pinned! This looks so yummy! My dad is Pennsylvania Dutch and makes this EVERY year… However, he browns the celery, onion, fresh parsley and bread (toasted) in one pan. Once the potatoes are mashed he adds salt and pepper (LOTS) to taste.. once that is perfected, he adds the celery mix and again salt and pepper to taste.. then he adds an egg and browns it all in the oven. I never knew there was any other kind of stuffing until I went to a friend’s house.. after eating this, who would ever eat the dry stuff??? I agree Christine, I can’t get enough of Amish Potato Stuffing! Thanks for commenting and stopping by! Mmmmm! I’ve never heard of potato stuffing before. Can’t wait to give it a try! Thanks so much for sharing at the #happynowlinkup! Oh, I’ve never heard of potato stuffing but I can see why you like it so much! Thanks for sharing with us at Fiesta Friday! 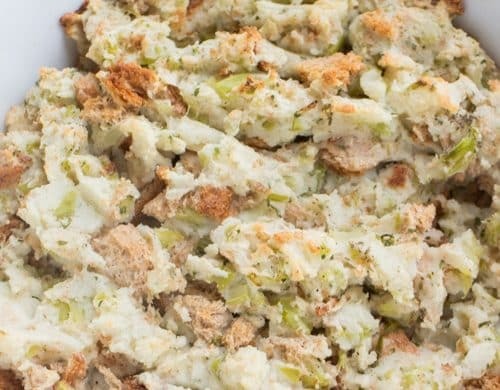 I grew up in Northern Maine where everything is potato, and my family actually made this kind of stuffing. And now, the Amish are settling here in Maine as well. I love the sound of this one – yummy! 😀 Thanks for sharing and happy Fiesta Friday! I like to try new recipes for dressing/stuffing – I usually make the “traditional” and then often will make another one. This year I added a sausage, apple, cranberry dressing and I think it was the best. Mashed potatoes – how interesting. Maybe for next year – thanks for coming to the party and sharing with Fiesta Friday. My mother-in-law makes potato stuffing for Thanksgiving and Christmas. It is a beloved dish in our family. We are from Pennsylvania. 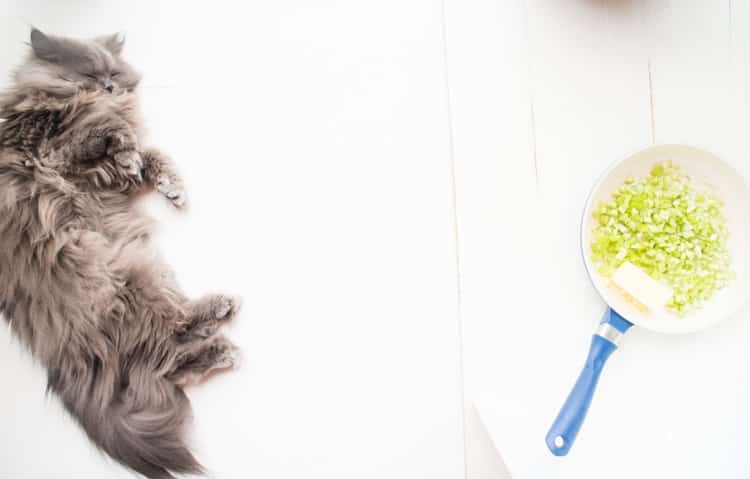 Your recipe looks delicious! It’d be great made with potato bread…another PA favorite. I make a potato and sausage stuffing but I also add chicken broth to it so it is moister. Many, many years ago my grandmother used to make something very similar to this but she made patties out of them and fried them. I have tried numerous times to duplicate her recipe (I never got it before she passed away) and was very unsuccessful. My aunt said it was her version of potato pancakes. I am definitely going to give this a shot. Nice! Looks good! Thanks for joining the To Grandma’s House We Go link party! Your post has been pinned! This recipe is exactly like my Irish Grandmothers. I always add mashed potatoes to my stuffing, it is so good. So surprised to see this recipe. I have always lived in Central PA and this dish has been a part of my holiday meals for 60+ years. We do a slight variation – after we saute the celery and onions and add the bread cubes, we also add a couple of well beaten eggs to the mix. Makes it very moist and helps it bake to a nice golden brown. And, as another comment mentioned, left overs get fried into lovely little patties of deliciousness! Merry Christmas all – hope your holiday tables are covered in goodness and love! My family 3 generations back that I know of have made this bread & potato stuffing ,,,,but we use summer savory here in Canada ! I grew up making “PA Dutch Potato Filling”. I also saute my bread cubes in butter to toast them. I use more potatoes than bread. Less breat more potatoes. I make these every holiday and my friends and family in NC ( that never heard of it or ever had it) ask every year if I’m making. My son’s girlfriend asks for it every year. should say less bread more potatoes. I totally forgot about beating a egg into the potatoes then fold the bread, onions and celery in. Into a backing pan , dot with (YES MORE) butter and bake. I put it into the oven when the turkey comes out to rest. Takes about 45 min using 3-4 lbs of potatoes. 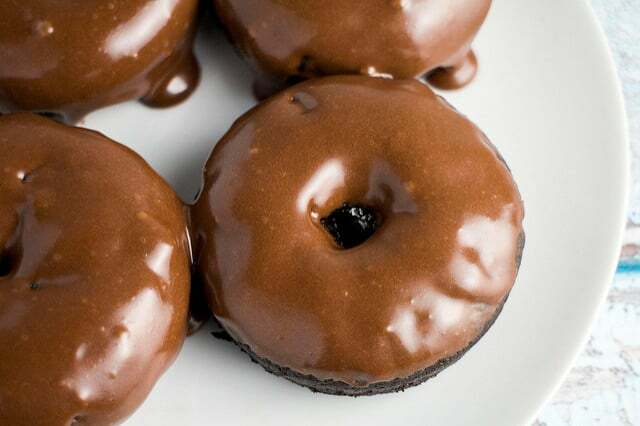 I make this but roll into balls , my mom in law from nfld used to make them , yummy with gravy ! Hey Pamela, I love them with gravy too! Stay tuned for a stuffing and gravy recipe coming soon.. I think you’d like it! Yum that sounds great Joan! Thanks for sharing! I made this yesterday to go with our pork chops. So good! My S/O loves the boxed stuff, but I never was a fan, too salty and pasty. Your recipe is so good that I have banned the box from my house. 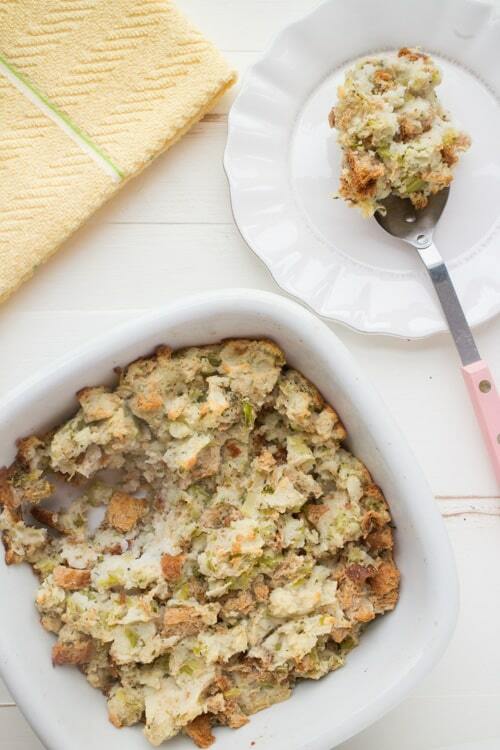 The perfect stuffing for Thanksgiving! Hey Susan, thanks so much for the comment! I’m so happy you both enjoyed the recipe! Also now I’m craving a stuffing and pork chops dinner! Tried this recipe this week. Made just like the instructions and it was very. Going to try it with homemade potatoes next. And I plan to serve it at Thanksgiving. Thanks for the delicious recipe! My Nana made the same stuffing. I use her recipe all the time. Same ingredients except hers was in lbs.